Tanzania, one of the largest countries in East Africa, is a tourist jewel that is too often overlooked by visitors to Africa. Home to the continent's highest peak (Mount Kilimanjaro), its lowest depression (the bed of Lake Tanganyika), its most famous national park (the Serengeti), and part of its largest lake by area (Lake Victoria), Tanzania's natural wonders are perfectly complemented by its excellent range of tourist attractions and activities. Travellers to Tanzania most commonly come in search of one or more of four famous travel experiences: a sun-soaked getaway to the island paradise of Zanzibar for an exotic beach vacation complemented by a visit to the historic, UNESCO-listed Stone Town; a snorkelling and diving holiday in the Spice Islands, especially Mafia Island, where a gorgeous coral reef system and the opportunity to swim with whale sharks draws underwater enthusiasts from all over the world; safari tours of Tanzania's world-famous game and wildlife parks, particularly the magnificent Serengeti National Park which annually plays host to the largest mammal migration in the world; and a visit to Mount Kilimanjaro National Park, often combined with the challenge of climbing the mighty peak, which rises out of lush rainforest and can be summited by comparatively inexperienced hikers. Tanzania's climate is characterised by distinct wet and dry seasons. Tanzania has two rainy seasons: the 'Mango rains' last from November to mid-January, and the chief monsoon season runs from mid-March to May. The best time to visit Tanzania is between June and August, when daytime temperatures are bearable, and nights are cool rather than sultry. For visitors to the Serengeti, the famous migration starts in late February - but be warned that this is an extremely hot time of the year, with the mercury rising as high as 90°F (32°C). Read more on Tanzania's Climate and Weather. -Stone Town's Anglican Cathedral is a must for those interested in African history. -Laze on one of Zanzibar's famed northern beaches like Kendwa and Matemwe, while watching picturesque dhow boats sail by. -The Makumbusho Village Museum in Dar es Salaam offers visitors the interesting opportunity to view traditional Tanzanian tribal homes. -The Central Market in Stone Town is a vibrant place full of sights, smells and sounds that will linger long in the memory. Read more about Tanzania Attractions. -Go scuba diving in the Spice Islands, at popular dive sites around the Mafia and Pemba Islands. -Go on safari in the Serengeti and see the world-famous mammal migration there, with more than one million wildebeest making the epic northward trip. -Ramble around Zanzibar's historic Stone Town district, and admire the gorgeous buildings and colourful bazaars that line the maze-like streets. -Travel to Mount Kilimanjaro National Park and attempt a hike up Africa's highest summit. Flights to Tanzania are available from a variety of European and Middle Eastern destinations. The flight to Julius Nyerere International Airport in Dar es Salaam takes about 12 hours from major British airports. American and British travellers will usually have to book an indirect flight to Tanzania, stopping over in Amsterdam. Get more information on Tanzania Airports. The Book of Secrets by MG Vassanji, The Snows of Mount Kilimanjaro by Ernest Hemingway, Great Sky Woman by Steven Barnes, and Shout at the Devil by Wilbur Smith. The African Queen (1951) and Darwin's Nightmare (2004). Mtori (cooked beef, prepared with bananas), mchicha (a vegetable-based stew with meat or fish added to it), and ugali (a polenta-style side dish made from corn flour). Konyagi, an alcoholic beverage somewhere between gin and vodka. Beaded African jewellery, carved soapstone figurines, Masai blankets and Tingatinga artworks. Pack sunscreen, lightweight clothing, after-sun lotion and effective insect repellent for a holiday in Tanzania. Remember that Tanzania is a predominately Muslim country, and that modest dress is required (no matter the heat). If you're planning to climb Mount Kilimanjaro, don't make the mistake of starting the hike in brand-new shoes. The TanzaCat Catamaran Regatta in September is popular among sailing enthusiasts, with thousands of foreign visitors making their way to Dar es Salaam's Msasani Bay. East Africa's top music festival, Sauti za Busara ('sounds of wisdom' in Swahili) is a celebration of African music, with hundreds of artists performing across four days in February turning Stone Town into a vibrant party scene. -The Great African Rift Valley, one of Tanzania's chief geological features, is visible from space. 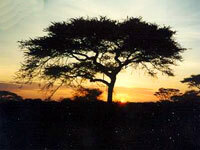 -The name Tanzania is a portmanteau of Tanganyika and Zanzibar. -The coconut crab, found on Zanzibar, is the largest crab in the world. A land overflowing with natural sights and wonders, Tanzania offers visitors a selection of unforgettable holiday experiences ranging from the swaying coconut palms of a Zanzibar beach to the action-packed wildebeest migrations on a Serengeti safari.